Simply hose each cage and empty one waste container! 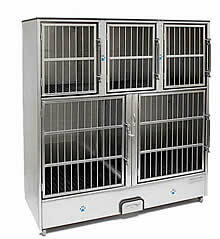 Fully assembled 20 gauge stainless steel cage bank on wheels includes 5 units, polyethylene removable floor grates, and has a unique waste drainage design that makes clean up easy! 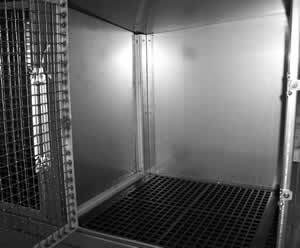 Each unit has a polyethylene (hard plastic) removable floor grate over a slanted floor which allows dog waste to flow down a channel in the back of the unit into a plastic waste container at the bottom front of the cage unit. Waste will wash down into the front waste drawer. Simply light hose each cage and empty one waste container! Wheels are attached to the cage bank. Front wheels are lockable. The wheels measure 2" high, swivel, and weigh 80 lbs. Wheels are made of a gray rubber and can be removed from the cage bank if you prefer not to use them. A divider is included with the bottom cages that can be removed to make one large cage.